The cancer research agency of the World Health Organization (WHO) announced there is “sufficient evidence” that processed meats can cause cancer. The group gave red meat a less alarming label, though “probably carcinogenic” is hardly comforting. The evidence of harm mostly relates to colorectal cancers in people who regularly eat meat. The overall cancer risk, while small, increases depending on the amount of meat a person eats. Why Did the WHO Classify Processed Meat as Carcinogenic to Humans? The International Agency for Research on Cancer (IARC) considered more than 800 studies investigating the potential links between cancer and eating certain types of meat. This year-long, deliberative process of evaluating the accumulated scientific literature led 22 experts to classify processed meats in the same category of cancer risk as cigarettes and asbestos. Why Can Eating Processed Meat Increase Cancer Risk? IARC’s findings received major attention, but the verdict is hardly new. Scientists have scrutinized these maligned foods for decades. Since 2002, the American Cancer Society has cautioned that the methods by which red and processed meat are prepared for human consumption and broken down in the gut can be problematic. “Meat processing, such as curing and smoking, can result in formation of carcinogenic chemicals, including N-nitroso-compounds (NOC) and polycyclic aromatic hydrocarbons (PAH).” High-temperature cooking by various methods such as pan-frying, grilling, or barbecuing can also produce PAH and heterocyclic aromatic amines (HAA). 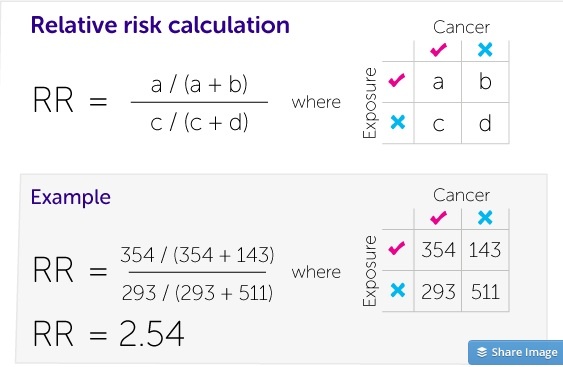 Risk measures the probability that cancer will occur, taking into account the level of exposure to the agent. So, how many hot dogs are safe to eat? We don’t know. The IARC does not provide guidelines on risk, nor do they recommend regulations, legislation, or public health interventions. We do know that eating a 50-gram portion of processed meat daily (about one hot dog) can increase a person’s relative risk of colorectal cancer by 18 percent. This means risk is multiplied by 1.18. But lifetime smoking increases risk of lung cancer fiftyfold. Scientists are still arguing about the relationship between food and cancer because the human body is inconceivably complex. To study the entire physiological system in a randomized control trial involves feeding real food to real human subjects for months or years, which is both prohibitively expensive and ethically questionable (if trying to measure if foods might cause cancer). Instead, researchers rely heavily on observational data. Studies can control for many possible “confounding factors” — or variables that may influence a particular outcome —but it’s impossible to account for everything that may matter. While the IARC acknowledged the many important proteins and nutrients in red meat, including vitamin B and iron, its report could hurt the American meat industry, which argues vigorously against linking their products with cancer. “They tortured the data to ensure a specific outcome,” said Betsy Booren, vice president of scientific affairs at the North American Meat Institute. The IARC defended its research. “On the basis of the large amount of data and the consistent associations of colorectal cancer with consumption of processed meat across studies in different populations, which make chance, bias, and confounding unlikely as explanations,” they wrote in The Lancet Oncology. The IARC classifications describe the strength of the scientific evidence about what causes cancer. Placing processed meat in the same category as tobacco doesn’t mean smoking cigarettes and eating bacon every day have the same cancer risks. 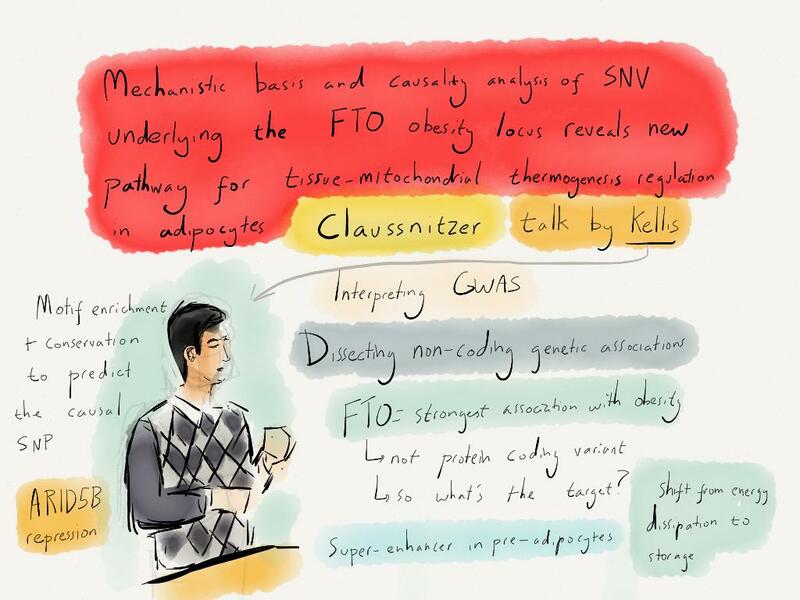 Sketch by Alex Cagan (@ATJCagan) of one of the New England Journal of Medicine study authors, Manolis Kellis, referencing first author, Melina Claussnitzer. What Is the FTO Gene and How Is It Related To Obesity? We know Body-Mass Index (BMI) has a strong genetic component, and we know being obese is a risk factor for leading global causes of death such as Type 2 Diabetes, cardiovascular disease, and cancer. 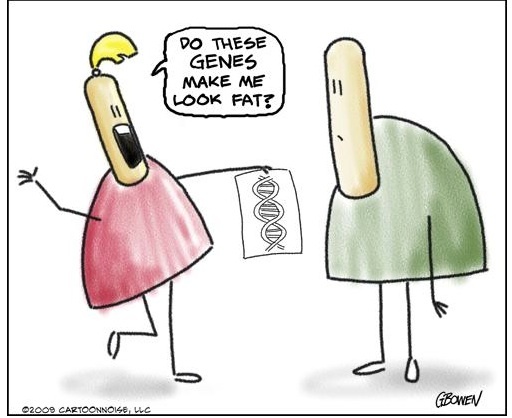 But until this week, we didn’t know how our genes might play a role in the mechanisms of obesity. The strongest genetic signal for BMI is in the FTO gene, but the causal nucleotide sequence and its function have been murky since its discovery in 2007. Obesity affects more than 500 million people worldwide, which is why a new study published in New England Journal of Medicine (NEJM) this week is so important. 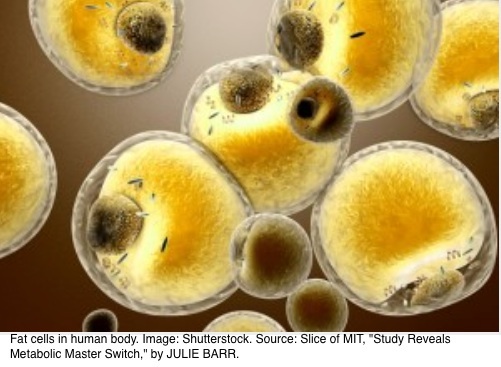 Melina Claussnitzer, Simon Dankel, Manolis Kellis, and colleagues at Harvard, MIT, Beth Israel Deaconess Medical Center, and the Broad Institute show how a faulty variant of FTO causes human adipocytes (fat cells) to store energy from food rather than burn it. Diet and exercise affect energy balance—unused energy is stored, primarily as lipids in white adipocytes—but how might genetics also contribute to metabolism? That is the question; the $2-trillion-dollar question if you consider obesity’s health-related costs and global economic impact. Brown adipose tissue is a key site of heat production (thermogenesis), while its lighter-hued relative, also known as beige cells, are known to develop in white fat in response to various activators. There’s a hypothesis that obese persons have fewer beige adipocytes and therefore are primed to gain weight on high-fat diets. Having the FTO “gene glitch” doesn’t mean you are predestined to become obese, but you could be predisposed to it. The FTO gene turns out to have an indirect influence on obesity, acting as a kind of “master switch” that affects two other genes that control thermogenics, or burning off energy by making heat. Thermogenesis can be triggered by mechanisms within the cells themselves or by the sympathetic nervous system in response to exercise, diet, or exposure to cold. With the completion of the Human Genome Project in 2003 and the International HapMap Project in 2005, researchers can locate genetic contributions to common diseases. Analysis of whole-genome samples for genetic variations that contribute to the onset of a disease are called genomewide association studies. For this week’s NEJM study, Claussnitzer, Dankel, Kellis, and colleagues collected subcutaneous fat samples provided by 100 healthy Europeans aged 20 to 50 years with normal BMI (20 to 24). Using a range of genomic techniques, the researchers found a mechanism whereby the basic function of human adipocytes shifted from storing fuel to using it. This work has at least four implications. The results support previous studies indicating that browning of white adipose tissue can affect physiology. There’s now a new strategy for how to use data from genomewide association studies and translate that information to help identify new pathways in health-related conditions beyond obesity. It may be feasible for an anti-obesity drug to nudge cells to use energy instead of storing it. This is a long way off, but the researchers are seeking a patent. Stay tuned for more debate about genetic engineering, ethics, and the intersection of science, technology (e.g., CRISPR-Cas9) and human disease, such as the article in this week’s Economist magazine. The global policy debate about education is in the midst of a “major pivot,” write Justin Sandefur and Mari Oye. The emphasis on increasing enrollment is being replaced by a focus on learning outcomes. The international development challenge is how to deliver quality, basic education to millions of kids worldwide. Enter the RISE initiative. 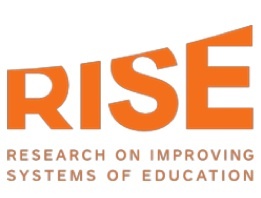 The RISE initiative seeks to understand how education systems in the developing world can improve learning levels for all children, including the most marginalized. Although enrollment numbers are up, Amanda Beatty and Lant Pritchett report that millions of students complete their formal schooling without mastering basic literacy and numeracy. Researchers have carefully calibrated the learning gains from specific interventions, like school feeding programs … And all countries have pockets of success where these tools are deployed effectively, with excellent schools and teachers delivering quality education. 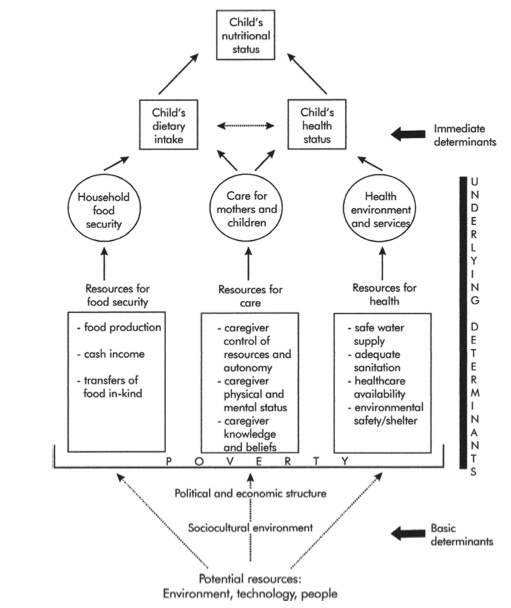 Source: Lisa Smith and Lawrence Haddad, “Reducing Child Undernutrition: Past Drivers and Priorities for the Post-MDG Era.” Adapted from UNICEF (1990, 1998), Engle, Menon, and Haddad (1999). What are the immediate, underlying, and basic determinants of positive learning outcomes in developing countries? To be honest, I don’t know. Anecdotally, optimal learning takes place when my brain is fully fueled with food—and, truthfully, caffeine. I start to fade when either ingredient wanes. Joseph Steven from Malawi feels the school meals he received helped him concentrate better. I learned about the two-day launch event (#RISElaunch) through Storify, which notified me that some of the scholars I follow on Twitter were in the roundup. I wrote this Tweet to Justin Sandefur. 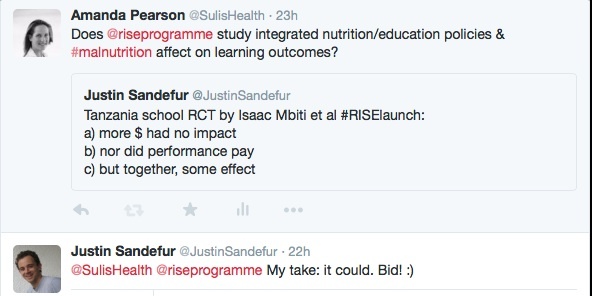 So, is there potential for RISE research proposals to integrate nutrition and education to accelerate the rate of learning in developing countries? Are competency levels in reading, math, and science associated with nutrition status? If yes, how might education researchers control for this in a trial whose purpose is to assess education systems? A trial-and-error search led nutritionists to conclude in the 2013 Lancet series that “nutrition-specific” interventions (e.g., vitamin supplementation) were insufficient in improving all forms of undernutrition. 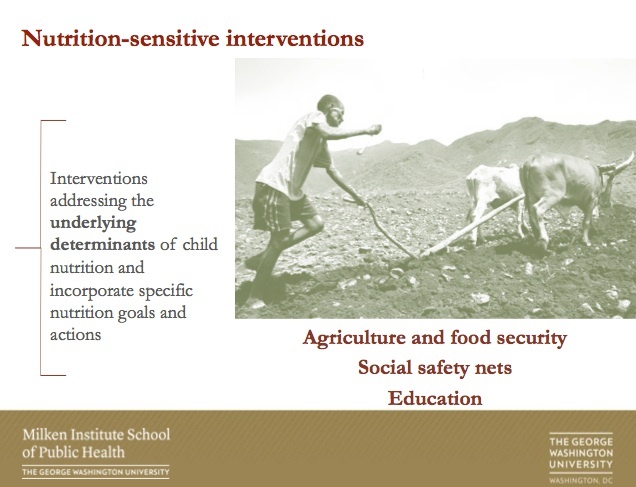 Source: Amanda Pearson, “How Can ‘Nutrition-Sensitive’ Agriculture Programs Be Effective in Reducing Undernutrition? A Case Study of Ethiopia.” Presentation at George Washington University, May 8, 2014. 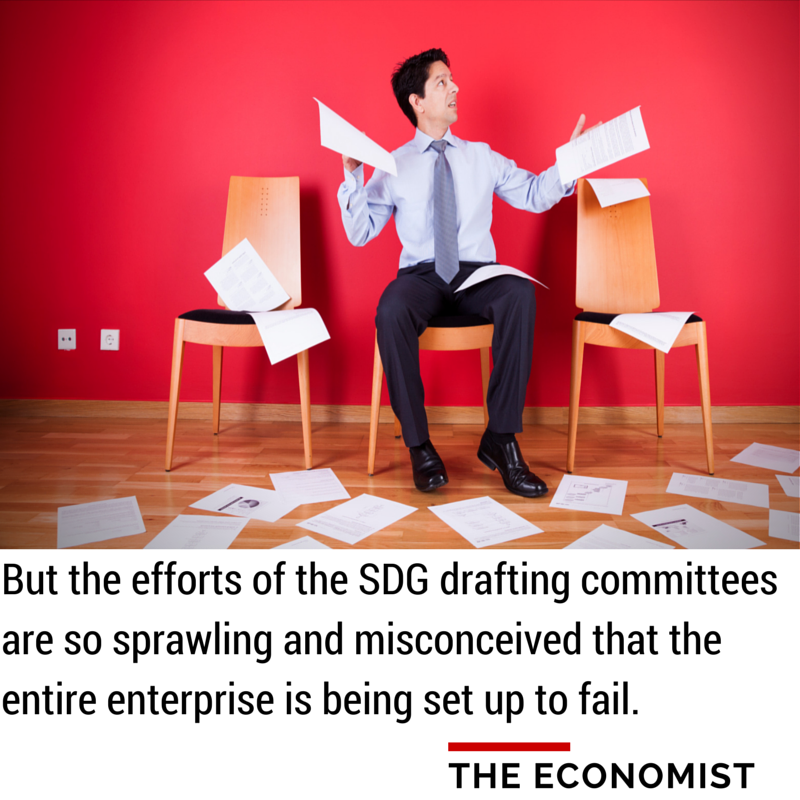 Read “‘Messy’ Sustainable Development Goals Irritate Economists” for more on this topic. One of my first professional writing assignments was as a rapporteur for a three-day conference in France hosted by Harvard University’s Weatherhead Center for International Affairs. Nine months after the 9/11 attacks on the World Trade Center, the Pentagon, and Flight 93, this gathering of political scientists, economists, and diplomats convened in June 2002 to discuss how US foreign policy priorities had shifted. 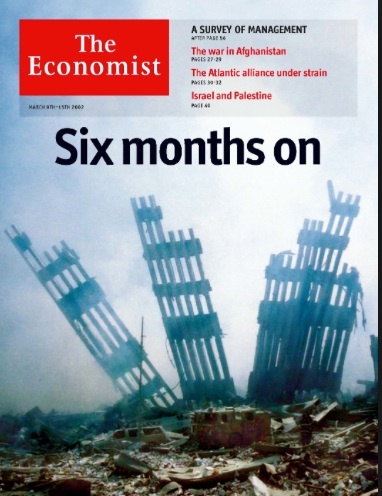 So what was going on in June 2002? 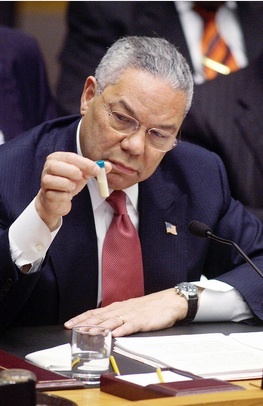 Secretary of State Colin Powell was also about to make the case to the U.N. Security Council that Saddam Hussein’s Iraq had weapons of mass destruction. In hindsight, 2002 was a pivotal year in US foreign policy, and this conference was a moment for both the American and European participants to reflect on the past—but also to take the temperature of their current relationship and to consider its future. Colin Powell, United States Secretary of State, briefing the Security Council on February 5, 2003. Panelists in the first session debated if and how US foreign policy should change in the next decade. William Kristol argued that Bush’s West Point speech (mentioned above) would reshape the US foreign policy agenda. The policies of containment and deterrence had long been at the heart of Western foreign policy. Kristol reiterated the significance of this shift, and he predicted that regime change would not be limited to Afghanistan, but that the Bush administration would seek to remove Saddam Hussein as well. Panelists from “Session 1: Bound to Lead or Homeward Bound?” represented opposing views on US foreign policy post-9/11. • Mearsheimer didn’t believe the United States would find it in its national interest to build an empire in the Islamic world. Mearsheimer acknowledged that Bush “talks Hawkish,” but he does not think Bush would go so far as to invade Iraq. Instead of a military proposal, Mearsheimer strongly advised that the United States focus on “winning the hearts and minds” of the Iraqi people. François Heisbourg observed how the events of September 11 had changed the United States—Americans now view the world through the prism of these attacks. Heisbourg commented how one of America’s founding myths is that it is a place apart, “protected by oceans of great distances.” This makes Americans profoundly different from Europeans who, for the most part, live with a recent past of invading armies in their homeland. • Heisbourg concluded that the war against terrorism would become too unpredictable and too widespread for the United States to effectively safeguard its interests without help from the outside. He predicted that the United States would soon discover that fighting against non-state terrorists requires assistance, especially in the realm of intelligence. Cindy Williams commented that as a military analyst, she preferred a tight military budget because it forces decisions to be made, clarified, and justified. In an ideal world, Williams would like US taxpayers to pay for the wars as they are fought, because this would help Americans understand the cost of the policies. US military dominance affords America a terrific amount of leverage, offered Barry Posen. However, the weaknesses in the current US military, or “zones of contestation” is where the “Clausewitzian fog of war persists.” The United States has attempted to bring technology to bear in these gray areas, but many of these problems are resistant to technological advances. • One of Posen’s concerns was the emergence of adversaries who are technically competent, highly motivated, modestly prosperous, and willing to die for their cause. The task for American military strategists in the future will be to successfully leverage the strengths of the US military and work with allies to shore-up its weaknesses. Jeffrey Frankel did not think that poverty alone leads directly to terrorism, or to Russian loose nukes, contagious diseases, or global environmental problems. The United States needs to remain engaged in global politics because regional problems that at first glance appear to have no direct effect on the United States can become larger problems if allowed to fester. Laurens Jan Brinkhorst discussed the differing concepts of sovereignty in Europe and in the United States. Over the last fifty years Europe has been engaged in a process that is in reaction to the unlimited exercise of sovereignty, which led to two world wars. The development of the EU is, for Brinkhorst, a world model that should inspire other parts of the world. It is born out of experience and an unfortunate nationalistic history. Europe needs to exercise more global leadership, “especially in those areas where the America vision of the world order is misguided or too narrow,” such as the environment and poverty. Following Posen’s response, a lively debate transpired about the distinction between preventive and preemptive war. • Mearsheimer noted a preemptive strike assumed the adversary has both the capability and the intention to attack, whereas a preventive war assumes capability alone. He compared and contrasted several examples in military history, including the 1981 Israeli attack on the nuclear site in Iraq, the 1967 war, and the 1956 war in the Suez. Preemptive war is a situation in which an attack is imminent, and thus a preemptive attack is justified. For example, political analysts such as Michael Walzer defend just war theory, even though he is almost universally against war. Mearsheimer proposed that the Bush administration was really presenting ideas about preventive war, in which intelligence dictates that a state will likely become a problem in the future. • Jessica Stern added that there is a clear distinction between preventive and preemptive action, but it is an operative distinction only when reliable military intelligence exists to inform the decision-makers. The real problem is that it is unlikely there will be any warning with regard to terrorist attacks. Stern suggested the more critical issue was how the rules for just and unjust wars apply to counter-terrorism and counter-insurgency. I wasn’t alive in the 1960s, but my father remembers exactly where he was when John F. Kennedy (1963), Martin Luther King, Jr. (1968), and Robert F. “Bobby” Kennedy (1968) were each assassinated. Likewise, people from my generation know where they were on the morning of September 11, 2001. Given this context, Stephen M. Walt and Jorge I. Domínguez had their hands full when they convened this annual conference. 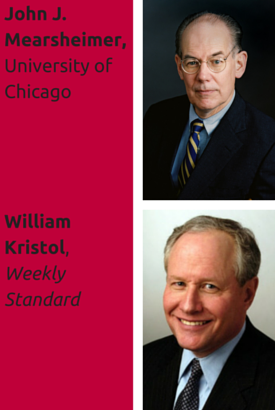 Three months after Talloires, several of its presenters signed a New York Times paid advertisement, “War with Iraq Is Not in America’s National Interest.” And Kristol predicted that Congress would grant Bush an authorization to use force against Iraq. He was right. The Economist pooh-poohs the post-2015 UN Sustainable Development Goals (SDGS) process in a series of related articles in March 2015. Why are they so pessimistic? 1. The scope is too broad. The first piece, “169 commandments,” refers to the number of targets associated with the 17 proposed SDGs. Proponents of the expanded mandate for the SDGs — addressing environmental issues, sustainable food systems, and good governance — argue the wider scope of the SDGs, when compared to the predecessor eight Millennium Development Goals, reflects an improved understanding by the UN of the complexity of poverty and poor health. Attempting to stay updated on how the post-2015 Sustainable Development Goals (SDGs) will address malnutrition is like trying to drink water from a fire hose. This week in New York (March 23-27) is the next session of the post-2015 intergovernmental negotiations on the SDGs. 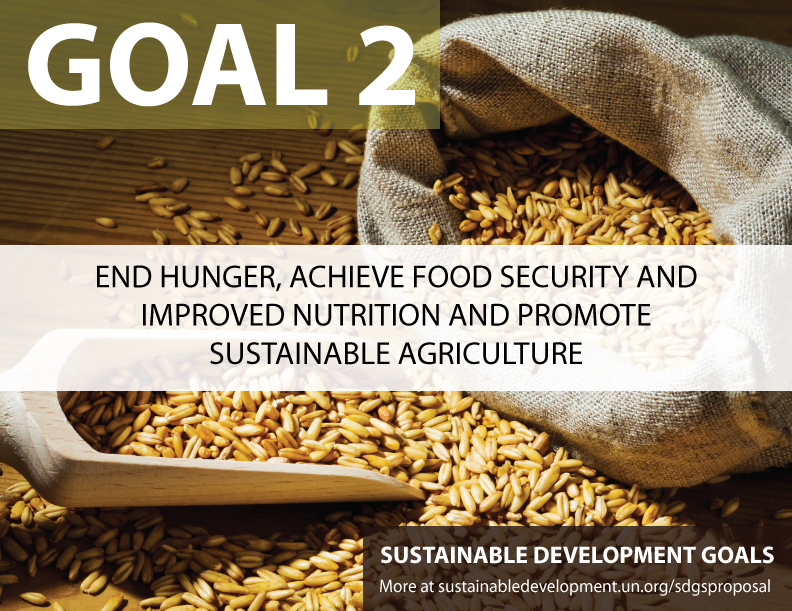 My previous posts on SDG Goal 2: End hunger, achieve food security and improved nutrition and promote sustainable agriculture are here, here, and here. My latest sip from the flood of information is about the United Nations Sustainable Development Solutions Network (SDSN).